I queued up at the Sokcho International Passenger Terminal for my ferry ticket to Zarubino, Russia, sweating in my riding gear among Korean, Japanese, Russian and Chinese travelers. I planned to enter Russia at Zarubino instead of the larger port of Vladivostok after hearing horror stories about the entrenched corruption at Vladik (that’s how Russians shorten Vladivostok). “Annyeong haseo. One-way to Zarubino please” earned me “No Zarubino. Valdivostok.” Assuming some sort of miscommunication, I repeated my request, which was met with the same response. According to this schedule, the next ferry to Russia would be on Sunday, three days away. As I paid my fair for today’s passage to Vladik, I made a hurried mental check of my plans. Did my Russia visa specify an entry at Zarubino? Did my invitation letter or tourist voucher specify my entry point? Was I making myself vulnerable to additional problems or costs at Vladik? I decided it was worth the risk rather than waiting another three days in Sokcho. While waiting for the departure time, I met with Mr. SungJin Kim, who spent a lot of time traveling between Russia, Korea, Japan, and China for work. He kindly bought me a frozen treat while we chatted. 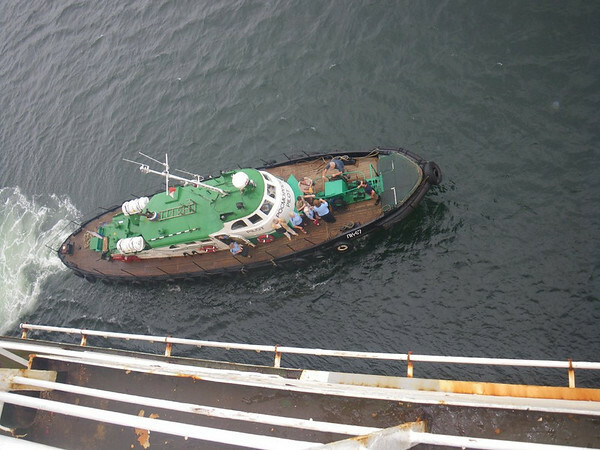 Like any seafaring vessel made of steel, the ferry New Dong Chun was in a constant battle with rust, and the lengthy struggle was showing on her. I rode the bike onto the lowest level, then up a ramp to the second deck. The warehouse-like feel of it made it difficult to believe that this structure would soon be steaming north on the Eastern Sea at 12 knots. The bike secured on the upper cargo deck. So long Korea. It would be my last sight of the Korean landscape, but Korean generosity was not finished with me yet. 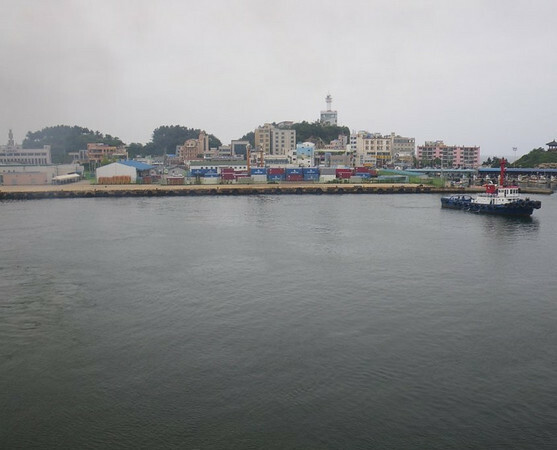 Steaming out of Sokcho harbor. My “ECON-B” class ticket had me in a room with six sets of bunks. One bunk-mate was a Russian named Ruslan, and we hit it off right away. 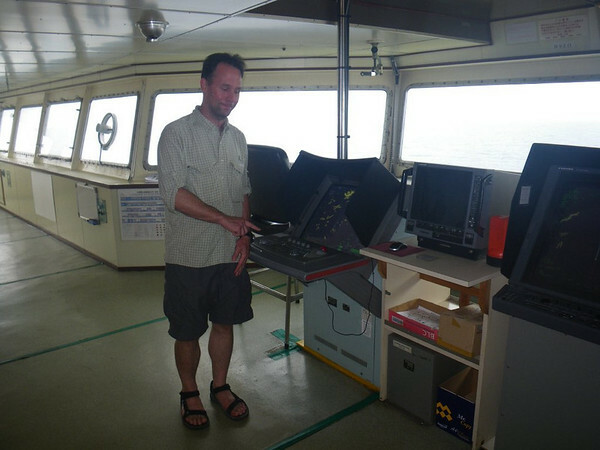 His education is as a ship’s 2nd Officer, so he shared many insights into sea travel and ship life. My newest Russian friend, Ruslan. He very kindly bought me a dinner of tasty Korean food at the ferry’s cafeteria, and then a beer (Korean “Hite”) from the vending machine. Tasty Korean dinner from the ferry's cafeteria. 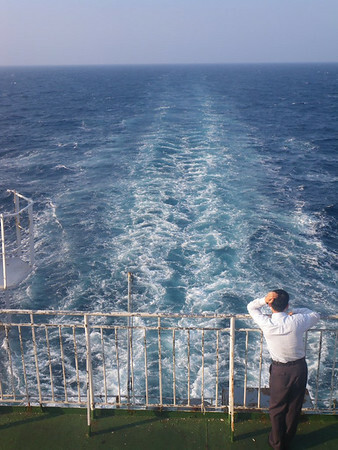 The 20-hour transit to Vladik left lots of time for watching the sea. Fellow traveler watching the wake. The ferry’s captain came by and Ruslan asked if he could get a tour of the wheelhouse later in the voyage. 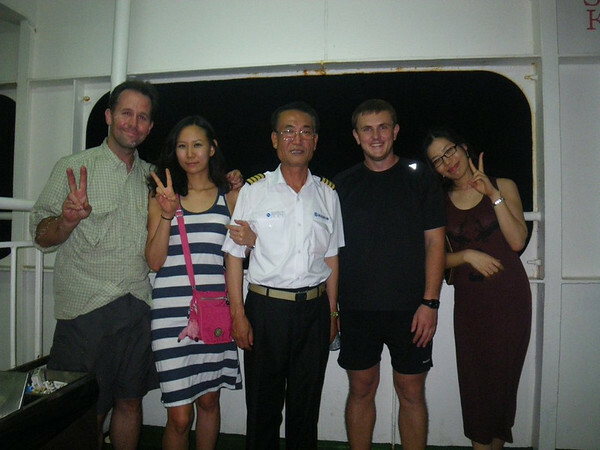 The ship's captain, Ruslan and your author, with Yoon Hee and Minh, two lovely Korean ladies we chatted with during the trip. Mid-morning the next day, Ruslan decided to find the captain to see if he could tour the wheelhouse, and I tagged along hoping to get a glimpse of the inner sanctum. After knocking on a few doors and asking around, we were granted access. 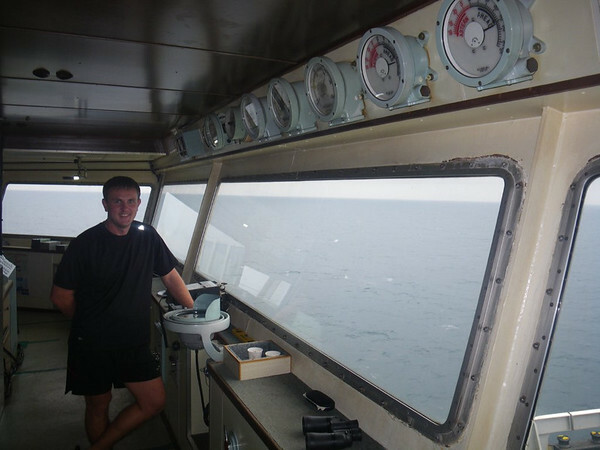 Big spassiba to Ruslan; without him I wouldn't have had a chance to explore the wheelhouse. Hmmm..what does this button do? 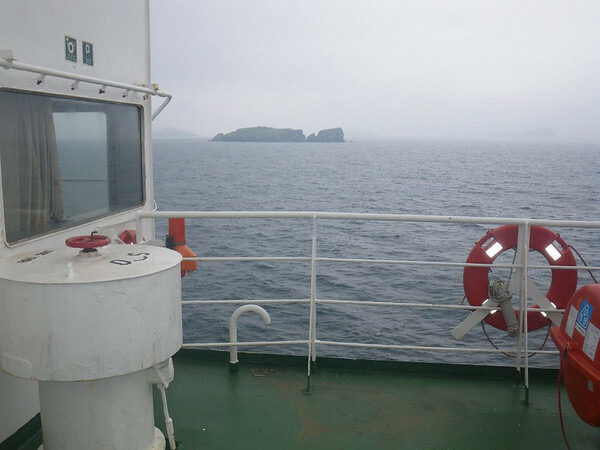 Eventually, Russian islands came into view through the fog. A pilot ship came alongside and deposited a small crew to help guide us through the shallow, narrow channel to the port of Vladik. The huge port handles a lot of cargo traffic. 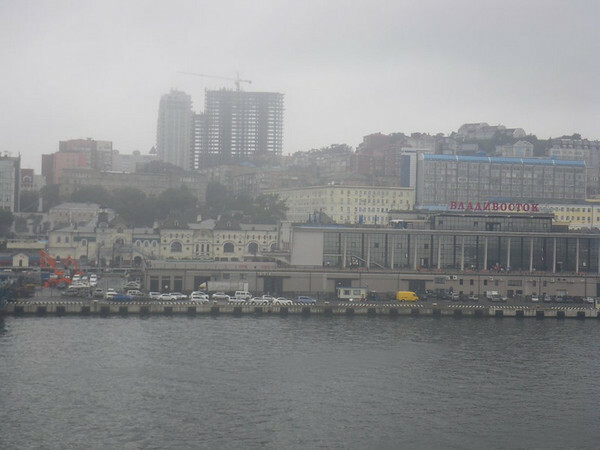 The Vladivostok Sea Terminal, with the train station in the yellow buildings to the left. We disembarked in a sweating flood of humanity into a sauna-like stairwell, waiting to be processed through immigration. Once my passport was stamped, I started asking around about getting the bike out of customs. 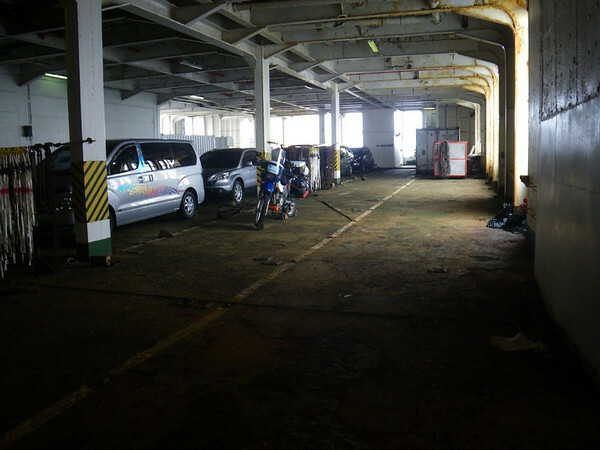 I was eventually directed to the Dong Chun Ferry office in the sea terminal (2nd floor, office #241), where Roman explained that since it was late afternoon on Friday, the process could not be started until Monday morning. That left a weekend for rest and sightseeing in Vladik’s downtown pedestrian areas and seafront. The full photo dump can be seen here.